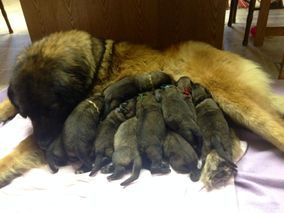 Keep visiting often for news and updates about upcoming litters!!! All of our dogs are CHIC registered and have been LPN1 and LPN2 tested "clear". Puppies have had a "well puppy check" from our veterinarian. Early socialization has begun with our large extended family, friends and other pets. We are currently accepting applications and deposits to reserve a pup for you! Shipping is available if needed. Please contact us at 360-435-6372 or [email protected] for more information. * August 1, 2018 Lowenholes Whimsical Kai Lie Chic# 91978 was bred to Frayleys Handsome Major Dogimus CHIC# 108811. Pups will be due Oct. 2018.